With Star Wars: The Last Jedi hitting theaters exactly one month from today, Dolby Cinema decided to celebrate by releasing a brand new poster, which features a prominent look at a rather ominous Luke Skywalker (Mark Hamill) along with Rey (Daisy Ridley) eyeing her master as if she is ready to strike in what could be the film's climactic battle scene. Standing beside her is Kylo Ren (Adam Driver). who's red lightsaber seems to be illuminating the entire image. The poster also features a number of other important characters including Leia Organa (Carrie Fisher), Finn (John Boyega), Poe Dameron (Oscar Isaac), Chewbacca (Joonas Suotamo), Rose Tico (Kelly Marie Tran), droids BB-8, R2-D2 and C-3PO, along with some of Snoke's elite praetorian guard. We also get a glimpse at X-Wings, TIE Fighters and AT-ACT vehicles. 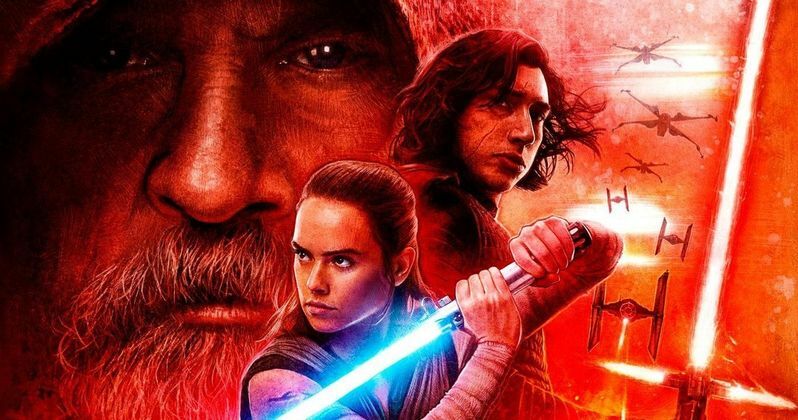 This poster comes just hours after four new Star Wars: The Last Jedi TV spots surfaced with bits and pieces of brand new footage. While it's possible that we may see more TV spots and posters, perhaps even a clip or two, it seems unlikely that another full trailer will be put out into the world, with just a month left before this highly-anticipated sequel hits theaters. While fans weren't expecting many details to come out, especially this close to the release, Daisy Ridley surprised everyone in a new interview, dropping some details about Supreme Leader Snoke (Andy Serkis). During a new interview that was released today, Daisy Ridley revealed an interesting tidbit stating that Supreme Leader Snoke is an "evil guy, if you can even call him a guy." Many have been wondering what exactly Supreme Snoke is, with some speculating that his holographic appearance is artificial, but we likely won't find out for sure until December 15. There has also been talk that, in the second trailer, Rey is actually talking to Snoke, and not Kylo Ren, as previously believed. Daisy Ridley revealed that Supreme Leader Snoke is, "one of those tests for Rey," and it's believed that the shot of Rey floating in the air, screaming in pain, is caused by Snoke (especially since eagle-eyed viewers can clearly see Snoke in the background). It is believed that Snoke has taken a great interest in Rey after she managed to get the best of Kylo Ren with no training whatsoever, although it still isn't clear how they ultimately meet in the first place. This Dolby Cinema poster also comes just a day after a new Star Wars: The Last Jedi IMAX poster hinted that Rey may in fact head over to the "Dark Side," which the second and final trailer also seemed to hint at. There had been rumors in the past that this movie would somewhat mirror the story from Empire Strikes Back, where Luke abandoned his Jedi training with Yoda to save his friends. The rumor was that Rey was to abandon her training on Ahch-To to leave and save her friends Finn and Poe Dameron, who had reportedly been captured by Kylo Ren, as part of a trap to lure her out of hiding so they could have a rematch of their iconic battle in The Force Awakens. Still, those plot details were never officially confirmed. We also learned a lot more about newcomer Kelly Marie Tran this week, after a new profile about the young actress revealed that she had never seen a Star Wars movie before auditioning to play Rose Tico. While there isn't much known about this character, we do know that she's a Resistance maintenance worker who goes on a mission with Resistance hero Finn, which takes them to the casino planet known as Canto Bight. While we wait for more on Star Wars: The Force Awakens, take a look at this new poster below, courtesy of Dolby Cinema Twitter.